Now that the weather is a lot nicer, a lot of us are spending plenty of time outdoors. However, if your leisure time in your back yard is often interrupted by wasps and other bothersome insects, you may start regretting your decision to go out. If you are seeing more than a normal number of wasps, it’s possible that there’s a nest somewhere on your property. It may not be that big of a nuisance now, but remember that a wasp nest can grow to have thousands of residents by the midsummer. You can consult experts such as http://beebusters.com/, to locate and remove the nest for you safely and quickly, or if you want to do it yourself, here’s how to find it. Most of us have seen wasp nests before. They are made of a papery substance that the wasps create. They collect the wood pulp from trees or wooden surfaces and mix it with their saliva to create the material. It is light brown to yellow, resembling old newspapers. The inner structure is comprised of countless hexagons, which makes it durable and light. The most common shape for a wasp nest is a football shape, typically hanging from one narrow side. However, if it is located somewhere in the enclosed area, it may just be a cross section of that, like a quarter of a ball. However, the color and the shape probably won’t be your first indication, but rather a huge number of wasps coming in and out of it. Wasps seem to like some places more than others when it comes to nests. That’s because they are looking for a particular set of conditions for their new home. First and foremost, they need the nest to be off the ground, meaning it is inaccessible to the predators who live on the ground. However, that is not enough. They also need to have it protected from the direct exposure to the rain, as it might damage the papery material it is made of. Wasps will also want to have a water source nearby for obvious reasons, but they are not too worried about the food source since they are known to forage quite far and wide for food. Some of the places which fit the bill perfectly and are as a result a common home for a wasp nest include the eaves of the house and similar overhanging structures. They have also been known to find (or make) holes in the walls and doorframes and live inside, with only a tiny, hardly noticeable crack betraying the entrance to the nest. Other places include under the dislodged roof tiles and mailboxes which are not used regularly. 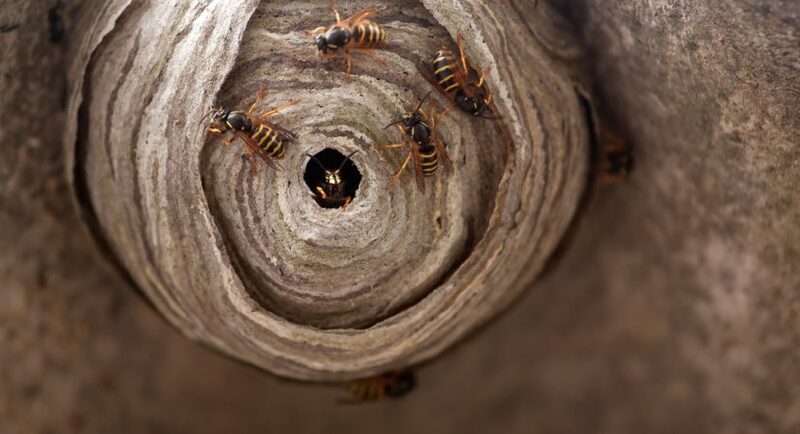 However, if you can’t find them in the man-made structures on your property, don’t forget that wasps have been around long before humans, which means that they have some natural hiding places as well. Holes in trees and thick bushes may provide ample protection for a wasp nest to thrive, too. When they see a wasp nest, people typically want to do one of three things. Either hit it with something, spray it with water, or burn it down. However, neither of these is a particularly effective way to get rid of a wasp nest, and it will almost certainly enrage the wasps and will provoke them to attack you. The proper way to dispose of a wasp nest is to consult professionals who can do it safely and quickly because they have all the necessary equipment and plenty of experience.